Jennifer Whalen and Reyne Pierce are employees of Pathfinder and fundraising volunteer for Fulton Block Builders. They are seen with Linda Eagan after presenting the Fulton Block Builder donation. FULTON, NY – Pathfinder Bank has donated $32,500 to the Fulton Block Builders making Pathfinder the largest corporate sponsor of FBB for the third year in a row. What’s more, Pathfinder embraced FBB’s new fundraising goal of $75,000 by increasing its donation over past years. The increase is indispensable in helping us to meet this lofty goal. The goal increase is due to the large number of applicants in 2018. Fulton Block Builders is a volunteer grass roots organization dedicated to community revitalization one block at a time. If FBB is successful in raising the full amount the Richard S. Shineman Foundation has committed $150,000 to the Fulton Block Builder program. Pathfinder Bank has been serving the Central New York Community since 1859. It is both their customer focused approach to providing financial services and its innovative philosophy that have made it what it is today. Pathfinder Bank’s aim is to provide all the advanced conveniences the national banks have to offer, without the hassles. 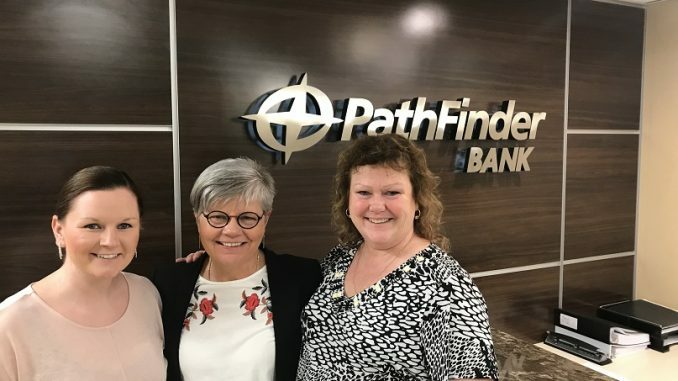 At Pathfinder Bank, the decision makers are dedicated local people and eager to serve the communities in which they live, work, and play. “Our success is intertwined with the success of the communities we serve. For that reason, and because it is the right thing to do, we invest our resources, time, and talents in those communities. We want to serve our local communities for another 150 years; therefore, we must earn the trust of our customers every day. We do that by being ethical, capable, honest, reliable, and responsive. Pathfinder Bank is proud to be the largest corporate sponsor of the highly impactful, community driven Fulton Block Builders program” said Tom Schneider, Pathfinder Bank president. 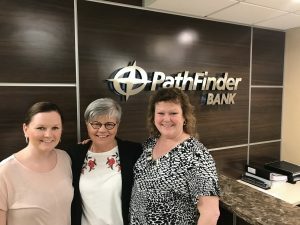 FBB is extremely grateful to the Pathfinder Bank and the Richard S. Shineman Foundation for its support of this program and encourages others to follow its lead. Whether you are an individual, a business or a community group FBB asks that you help support this energizing program by donating today. Every dollar helps FBB reach this goal. Other Fulton businesses are donating to the FBB initiative. Mark Southwick, Huhtamaki Plant Manager and Joe McConnell Operations Manager are seen here with Linda Eagan, Fulton Block Builders (FBB) Administrative Director. 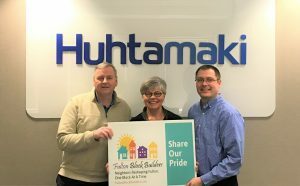 Mark Southwick and Joe McConnell from Huhtamaki-Fulton recently presented Linda Eagan with a check for $1,000.00 to support the Fulton Block Builder matching grant program. Last year, Southwick and McConnell spent time learning about the program from Eagan and brainstormed more ways that Huhtamaki could lend support to this program. One of the most exciting ideas to come out of the session was Huhtamaki’s suggestion to help FBB advertise during the period that FBB applications are being accepted. Huhtamaki proudly bears the name of its founder, Mr. Heikki Huhtamäki. Young Heikki, a village baker’s son, established Huhtamäki Industries in 1920 in Kokkola, Finland. Its purpose is to help great products reach more people, more easily. Today Huhtamaki operates around the world, manufacturing in six continents. Making it well placed to serve both global and local customers. Community Bank N.A once again donated $5,000.00 to the Fulton Block Builders program. Community Bank supports the Fulton Block Builder program and encourages others to do so. 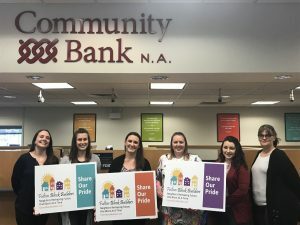 “FBB is thrilled to have the continued support of Community Bank N.A. This year, the fundraising committee has a greater fundraising goal, we seek to raise $75,000 in order to realize the Richard S. Shineman Foundation $150,000.00 grant. Community Bank’s support of this program is greatly appreciated. FBB has now raised $60,000.00 toward our goal. This is a program that is making significant differences in our community” said Eagan. In 2018, there was nearly a half of a million dollars invested in Fulton’s participating properties! For every dollar invested by Fulton Block Builders- property owners invested 3.5 times that amount. “Operation Oswego County Inc. has increased its Fulton Block Builders donation from $2,500 to $3,000 putting FBB closer to our fundraising goal!” said Eagan. In addition to OOC, FBB recently was notified of support from Ace Northern, Burke’s Home Supply, Ontario Orchards, Lakeside Roofing and Siding, and Waldron’s Furniture. Residents participating in the Block Challenges will be happy to know that all of these businesses will be offering discounts to approved FBB grant recipients,” Eagan said. 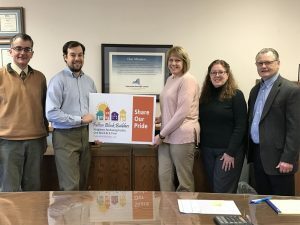 From the left are Operation Oswego County staff, Kevin LaMontagne, Business Finance Director; Austin Wheelock, Deputy Director; Karen Perwitz, Administrative Secretary; Evelyn LiVoti, Marketing Manager and Mike Treadwell, Executive Director. “Key to our mission is the creation and retention of job opportunities, diversification and strengthening of our economic base, and developing the local economy in a planned, organized and environmentally friendly atmosphere. We think the Fulton Block Builder project fits into this mission perfectly. OOC is particularly proud to see the increase in residents purchasing from our local businesses. This is a win-win for everyone in the county” said Michael Treadwell, executive director.